What is Offers2Cash? In this Offer2Cash review, I will be explaining how the site works and see if it is a legitimate site in which to make money online. So let us dive right into it. Offers2Cash is a GPT site, which stands for “get paid to.” You can sign up one of three ways, either through Google+, Facebook or Twitter. Sign up is easy…unless you don’t have or want a social media account. If you do, however, sign up is a snap. Another great feature is Offers2Cash is available to anyone in the world to start using and make some money. You can convert your Offers2Cash Coins into these. It is where you can earn money through various methods. Offer2Cash is the new guy in school and only been around for a short amount of time and not well established like other GPT sites. Videos – Earn money by watching videos. Videos – This is probably the simplest method of earning but also pays the least. At the time of writing this post, they had two options for videos, and they are SuperRewards and Offertoro. Most videos pay you 1 Coin for each video watched. You should be multi-tasking when watching videos because your time is worth more than what they will be paying you for viewing the video. Offer Panel – This probably has the most options out of the whole lot. What the Offer Panels are is companies or certain websites that have tasks. These tasks are described in the offer. So, it easy enough to understand and follow. Daily Offer – These are offers that you have to sign up for with real personal information, play games, installing games and applications. These are a one time offer, and you won’t see them again once you have completed it. Surveys – You either love surveys or hate them. They are no different here. The same random buggy-ness that drives me to pull my hair out in big clumps. Me personally I avoid surveys at all cost, but I don’t knock people that love doing them. Don’t expect to qualify for every survey either, as you will be disqualified due to your personal information, race, age, factory worker, etc. Bethouse – This is one you don’t normally see any kind of a surprise to see this. Basically, you just sign up for gambling site at a predetermined dollar amount and are awarded coins. Offers2Cash: What makes them better? Customized Offers – Tired of the typical panels? Offers2Cash has besides those standard panels they have a bunch of their own offers which are easy to complete. More Profit For Your Time – Offers2Cash claims they pay more than anyone else for completing offers. Check it out for your self. All In One – Offers2Cash claims it has all of the other GPT sites combined and you’ll reach your minimum payable amount a lot faster. So What Are Coins Worth? To exchange your Coins for Gift Cards or money you have to go to Gifts on the left-hand side of the screen. So for $5.00 gift cards, it takes 5,000 Coins to be able to redeem them. Anyone can join Offers2Cash. It is available to anybody worldwide. Multiple forms of payment are available at Offers2Cash. 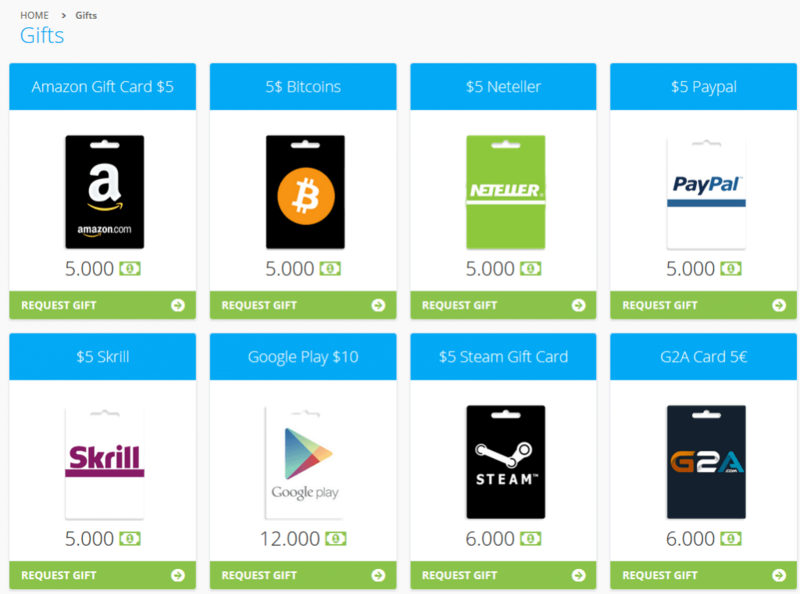 They include Paypal, Bitcoin, Skrill, Payza, and Gifts. Offers2Cash has a referral program. For each person, you refer you earn 15% of whatever they make. The site is not flashy, and it is laid out simply without a lot of eye pollution. I really like this minimalistic approach. Able to receive alerts from Offers2Cash when the offers you have completed have been credited to you. Most ways to earn at Offers2Cash have a Help or contact button in case of questions or problems. Easy to earn Coins from this website, but keep in mind your not going to get rich doing this. New GPT site to the scene, hasn’t been around long enough to establish itself with trust and members. Multiple ways of signing up through social media, Google+, Facebook, and Twitter but…for people that don’t like or use social media it’s a no go. Either change your ways or look elsewhere. They have banners to promote Offers2Cash, but they are in Spanish. Nothing against Spanish but it would be nice to have English too. Some offers take a few hours to be credited to you, it’s not horrible, but it could be faster. Also, it could take up to 7 days for offers to be credited to you, and this is the worst case. Most offers will convert instantly or within the 30-minute window. You’re on your own with Daily offers that are not credited to you because they say there is nothing they can do. In all likely hood, the process wasn’t completed correctly. A tip for watching videos, by no means just sit there and watch the videos. Shrink the video to a small size or use a second monitor and allow it to play on it. If you just leave it in the tab and click on another tab, the videos stops. You should be multi-tasking when trying to earn money from sites these to maximize your earning potential in the shortest amount of time. For example, you could be doing other available tasks at Offer2Cash or other surveys site. Or creating content on your blog. They bundle the videos, so you don’t have to click every time a video is done to watch a new one. If your videos are choppy or don’t work try updating Adobe Flash player and this should solve the problem. Using another site (other GPT sites) seems to conflict with your Coins being credited to your account. So, just be mindful of that fact. Offers2Cash also suggest for you to be credited your Coins to delete your cookies, and also enable them on your browser. Turn Antivirus off (I don’t recommend this), always use your real personal information, don’t use computer programs that block websites, ads, and or cookies. Get referrals, if you have a blog or website, write a review on Offers2Cash and use the referral link to help sign up new people. If you need a site, you can get one here for FREE! Sign Up Here For Free Website! Then sign up family or friends that are interested along with your website viewers. If you want to learn about building a website to earn money, I Highly recommend checking out my Wealthy Affiliate Review here and joining. This is how I learned to start making money online. There are so many alternative websites to Offers2Cash. I will highlight a few of them. I have also been referring people that use survey sites to check out Dealspotr. I really enjoy this website. You can read my full review here, What Is Dealspotr About? It easy to make money and save money as well. Inboxdollars – My review of Inboxdollars, An Inboxdollar Review. SuperPay.me – My review of SuperPay.me, Is SuperPay.me A Scam? Swagbucks – My review of Swagbucks, Is Swagbucks Legit? instaGC – My review of instaGC, Is instaGC A Scam? Prizerebel – My review of Prizerebel, Earn Money From Home. Offers2Cash is for someone to earn a little extra money for the month. You are not going to get rich with this, but it will pull in extra pocket money. There isn’t any training or tools at Offers2Cash, but most offers are explained enough for you to understand what to do to earn Coins. They do have the FAQ page and a contact page for support. Again, this is free to use. They pay you for doing tasks. Although, I wished this company had been around longer to establish more of a reputation online, to help determine its legitimacy. I haven’t seen any failure to pay people online from Offers2Cash, so it must pay. I haven’t used the site enough to build up a sizeable position to cash out and see for myself…yet. You’re not going to be padding your wallet with using a site like this, but you will pull in some money for your efforts. Just keep that in mind. I would have given this site a little higher rating if was around longer because it seems easier to earn than Coins than some of the well-established GPT sites. If you are looking for real money and a real business that is doable for anyone I suggest you read below. Instead of wasting valuable time on survey sites, I recommend investing in your own business. I am a current member and can honestly say IT WORKS!